I have been watching the colors outside changing. My dear fall. . . how do I love thee? My favorite fall change is the color of the hydrangeas. I am seeing so many dusty plum and antique versions of my favorite bloom. This inspired me to make a single head antique paper hydrangea in a pretty dusty mauve with a green undertone. 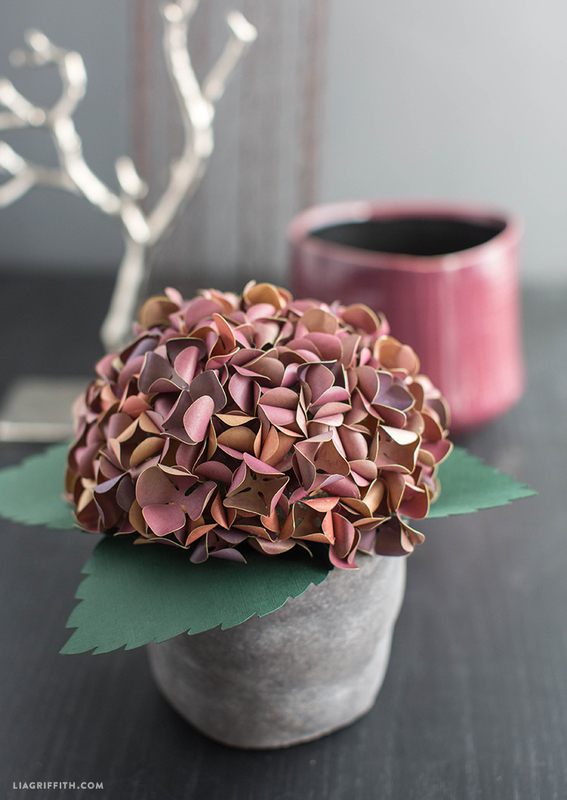 To craft your own paper hydrangea for fall, follow my 8-step tutorial below. If you love making autumn flowers and want more ideas, you might also like my crepe paper mums for fall or my red paper peonies. I’d love to see what flowers you create for fall, so don’t forget to share your projects on Instagram with the hashtag #MadeWithLia. I created this antique paper hydrangea by printing a plum watercolor wash onto frosted lime text weight paper. You can find this printable at the end of the post. Note: I printed on both sides to get the color variation I was looking for. For the single head, I used the foam ball method to build the base. Once I completed the flower, I made the leaves from a dark evergreen cardstock that I found at Michaels. You can download the PDF template or SVG cut file below and follow our step-by-step directions to make this pretty fall bloom. 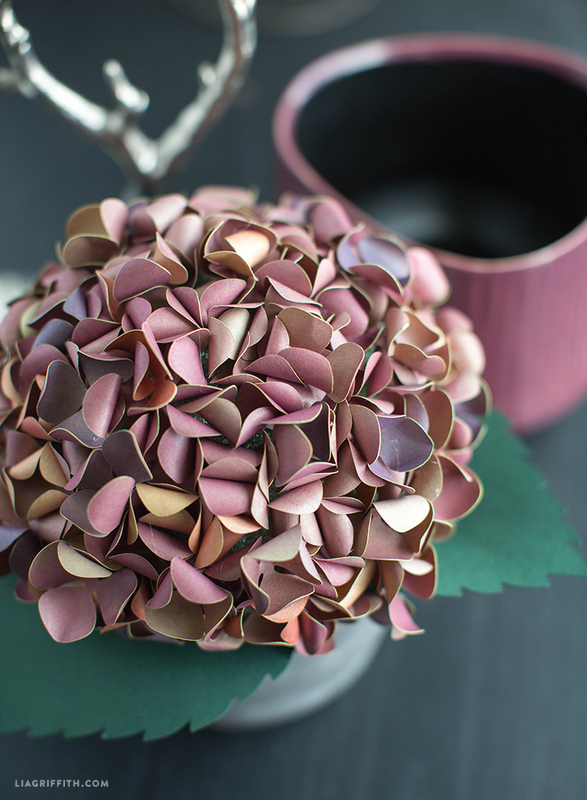 I’m looking at doing paper flowers for my bridal bouquet – do you think this would be too heavy to use in a bouquet, because of the weight of the foam ball? Hi Lia, what is the size of the foam ball you use? Thanks. A 5″ or 6″ ball works great! Do you just use a regular printer? So much of your stuff appears metallic and I just don’t know that my printer would achieve the same looks. Thanks! For a lot of our projects we like to use metallic paper from Paper-Papers brand, which you can order from their website 🙂 We have found that it makes for a great result for many of our crafts! And generally, yes, we do just use a regular printer. Could you recomend me a web site to buy the Lime text weight paper? I live outside the US (Dominican Republic) and is not always easy to find here this type of paper. I love your proyects!!!! You’ve have been an inspiration for me!!!! I even bought a Cricut machine!!! Thanks!!! Congrats on your Cricut machine purchase! It will open a whole new world of crafting for you. As for international shippers of text weight paper I am sorry but I have no idea. I’ts me again. I have a shipping address in the US, so any website to buy paper would be a great help for me!!! Thanks!!!!!! We love the paper we get from Paper-Papers.com, for the flowers we almost always use text weight paper. 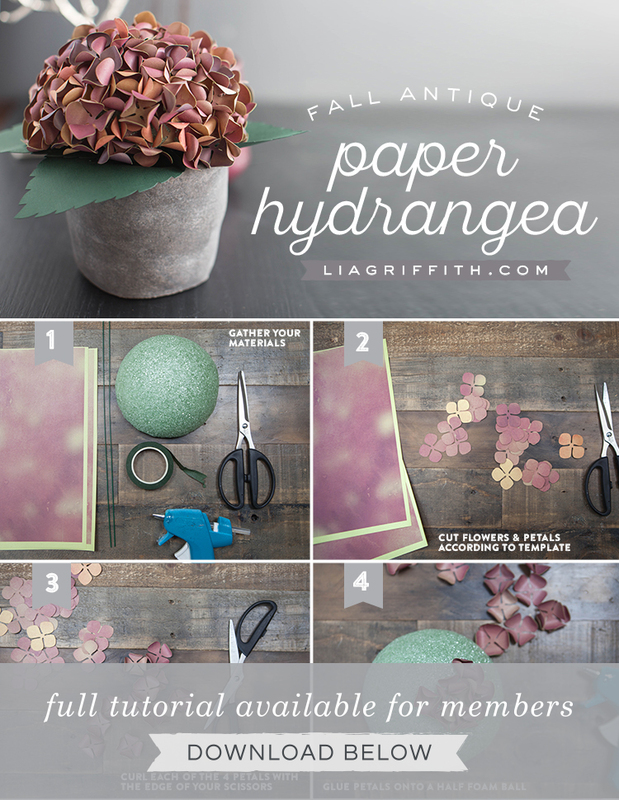 Hi Lia, the hydrangea looks great and I’m definitely adding that to my list of crafts for the fall. May i also ask why we need to add the 3 wires below the ball? Thanks! Oh wow those are so beautiful! Definitely going on my “fall crafts TO DO” list!